He [Luther] heard him [senior friar] discuss many things about the faith, and he said that he was led to the Creed [ad symbolum], in which is said, “I believe in the forgiveness of sins.” [The senior friar] had interpreted this article [of the Creed] in such a way that it should be believed not only in general, that some people are forgiven, like David or Peter [had been forgiven], something also demons believe, but that it was God’s commandment that we as individuals are to believe that our sins are forgiven. And he proved [to Luther] that this interpretation was confirmed by a saying of Bernard, and he showed him the locus in a speech [concio; i.e., sermon] on the Annunciation where these words are found. First of all, Luther was not a loner or a constantly depressed introvert. He always was in conversation with fellow friars. In this regard the biography of Richard Marius is mistaken, as mentioned above, by assuming that Luther in his “flight into the monastery” sought solitude in which then Luther’s inner struggles were compounded by his monastic isolation. Quite the contrary! Senior friars at Erfurt such as the anonymous senex were of decisive spiritual help to the young man, and so was Johann von Staupitz, his supportive superior (see Chapter 2. 5. 1.). Secondly, the senex’s help in advising Luther to read Bernard’s sermon has far-reaching ramifications. Luther in the course of his career will quote or hint at Saint Bernard more than 500 times (see the loci in WA). Quite in contrast, only one real quotation from Thomas Aquinas can be found, dated 1521 on receiving the Eucharist under both species. Thirdly, the senex had a print of Bernard’s sermons at hand. The Erfurt monastic library catalogue shows that the Augustinians, indeed, had Bernard’s Sermones de tempore et de sanctis (Basel: Nikolaus Kessler 1495) in their possession which included Bernard’s Sermons on the Annunciation with his theology of grace and penance. Melanchthon did not know about these editions of Bernardine sermons. He only reported that Luther was made aware of a certain passage in a certain sermon. Notable is the fact that since we do not have the book with the Bernard sermons (that the senior had shown him) Luther himself somehow tried to keep track of what he was reading about Bernard as Luther entered excerpts from Bernard into his desk copy of Anselm (1033–1109). Evidently, Luther looked up what the senior had told him, i.e., Bernard’s “sermon on the Annunciation,” but ended up reading Bernard’s sermons about the gospel Missus est angelus (In laudibus virginis matris) which are a different set of Bernardine Sermons for the Feast of the Annunciation. From the former he made his notes in Anselm’s book. The homilies on Missus est angelus did not contain the decisive paragraph that the senior friar quoted to Luther about grace alone. Fourth, the source reference which the senior friar provided, according to Melanchthon, was precise, but not precise enough. Melanchthon faithfully reported the precise wording of the Bernardine quotation which the senior friar had pointed out to Luther, but not the exact source reference. The quotation is found verbatim in the first of the three sermons on the Annunciation (Ann 1). The quotation was so important that Melanchthon cited it in full length. It is the longest direct quotation from any author in his biographical sketch of Luther. Fifth, the Latin terminology (locus, concio) which Melanchthon used for the source reference is likely colored by the humanistic-rhetorical tradition. When he reported that the friar “showed him the locus in the concio on the Annunciation where these words are found,” he implied with respect to locus (Greek topos) that this passage contains the main idea of a larger text. The locus is lifted out of the context of the lengthy sermon (Ann 1) in order to mark a dogmatic point of Christian doctrine. Sixth, what Luther reported to Melanchthon about the older friar’s comments about the nature of “faith” has something to do with the two different concepts of “faith,” a distinction which always was appealing to Melanchthon who contrasted “historical faith” (a “faith” that also demons would possess) and existential “trust” and justifying faith that brings certainty. Only the latter is meant by Paul’s and by Bernard’s concept of “faith”: “The Spirit itself bears witness with our spirit that we are children of God” (Rom 8:16). Rightly, Jared Wicks criticized this kind of interpretation in his book review: “Facts and Fears in and Around Martin Luther,” Moreana 37 (2000): 5–32; see LD 10 (2002): 230. The year 1495 saw at least two other editions of Bernard’s Sermones de tempore coming off the presses, one from Johannes Emericus in Venice and one from Leonardus Pachel in Milan. From The Real Luther: A Friar at Erfurt and Wittenberg, pages 94–96 © 2011 Franz Posset, published by Concordia Publishing House. All rights reserved. 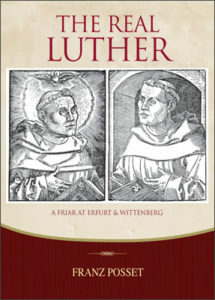 To order The Real Luther, please contact CPH at 800-325-3040 or visit www.cph.org.